Not Too Late is a lovely set of songs, both bittersweet and powerful, that reassures us that pop music can be beautiful and genuine. Norah Jones won eight Grammys for her 2002 debut Come Away With Me, which sold over 20 million copies. Jones moved around 11 million copies of 2004's Feels Like Home, which won her several more Grammys. It is a testament to Jones's true talent that both albums went platinum while differing so greatly in style: Come Away With Me was gorgeous, piano pop tinged with jazz and blues, and Feels Like Home was quite a bit less blues and much more country, including guest artists Dolly Parton and Levon Helm and Garth Hudson of The Band. Not Too Late, Jones's third release on Blue Note, comes again with a completely different feel. It is certainly not a 180 degree turn from her first two albums, as Jones' luscious voice and graceful piano remain intact, but is a departure from her previous sound nonetheless. This may be due to the fact that this is the first album on which every song is self-written or co-written by Jones; the result is an album somewhere between pop, folk, country, and blues, full of mellow, enchanting melodies. It's strange to hear sad, plaintive piano -- usually reserved for tragic breakups -- used as a means of criticizing the President, but surprisingly, it works quite well. Innovation and variety aside, the tracks that work best are the straightforward pieces that simply showcase Jones's rich vocals and solid work from her band. On "Until the End", piano, organ and strummed guitar fit together perfectly in blues recalling Come Away With Me, as the vocals state, "Like a child/ You remember/ But I forget all my dreams." The chords slide by as Jones nails every rise and fall. The obvious single here is "Thinking About You", beautifully composed and powerful in its finale, wherein the trumpet and sax lines are tight and punchy, and the piano and organ complement each other ideally. This album feels a bit more melancholy, a bit more pained than Jones' previous work. "Wish I Could" describes the pain of a love lost in war, and on "The Sun Doesn't Like You" Jones achingly sings, "The song doesn't like you/ You always get burned." The general tone of the album seems to be one of hushed sadness, the quiet kind that persists even through good times. On "Rosie's Lullaby" we hear, "She walked by the ocean/ And waited for a star/ To carry her away." Not Too Late serves as a gentle reminder of the myriad injustices we find in life, and yet Jones also finds the beauty in life despite the bad, and ultimately the disc is hopeful. It is the final two tracks, "Rosie's Lullaby" and "Not Too Late", that prove to be the most affecting. Both are subtle and understated, touched with simple piano chords, guitar, bass, and drums. Jones's voice is lush, articulate, and soulful. At the end of the album, when she soars, "It's not too late for love", I am fully convinced. 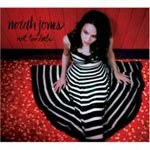 Norah Jones proves herself to be as great a songwriter as she is a pianist and vocalist, and the work of her band here is equally strong. Not Too Late is a lovely set of songs, both bittersweet and powerful, that reassures us that pop music can still be beautiful and genuine.